The Oklahoma-Army football game was a thriller, with the No. 5 Sooners hanging on to beat the Knights 28-21 in overtime. It was not expected to be a thriller, or anything close to that. Oklahoma entered the game as a 29-to-31-point favorite (depending on the book). So, when Army tied the game 21-21 in the third quarter, college football fans were scrambling to find the game on television. No luck. That’s because the game was only available through a Pay-Per-View service associated with Fox. Well, the cost of the game through the Pay-Per-View service was $54.99 (!) for the streaming option, and $34.99 through Cox. The cost for the OU-Army game varies per provider (Cox charges $34.99), and Sooner fans by the thousands purchase the game. You can do the math. That’s why Fox makes the game pay-per-view. When Fox network picked up the OU-Florida Atlantic season opener, that virtually assured OU-Army would be relegated to pay-per-view. Even if Sooner officials don’t like it. Every Big 12 member retains one non-conference football game per year for its own distribution. OU years ago signed on with Fox Sports to create the Sooner Sports Network, and part of that agreement was giving Fox Sports the rights to that third-tier game. Fox Sports can do anything it wants with the game. Sell the game to another network. Put it on over-the-air broadcast. Place it on cable. Don’t televise it at all. Show it on pay-per-view. Pay-per-view is the most lucrative platform for Fox, since OU fans have a long history of purchasing pay-per-view offerings, even at $54.99, the cost of the OU-Army game. So, the only people that could watch this game *legally* had to pay this crazy price (though the game ended up being good enough that perhaps it was worth it). Eventually social media learned of a Twitch stream showing the game. 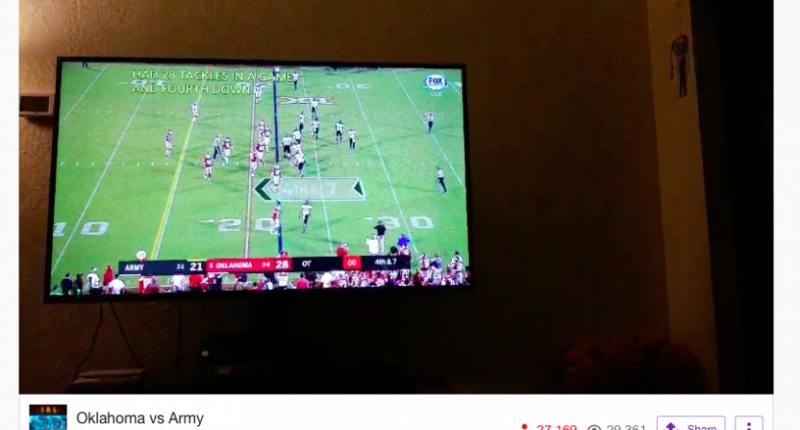 Well, technically it was some Twitch user holding up their cell phone to a television and streaming the game that way. Seriously. And around 32,000 people tuned in to watch. It shouldn’t have to come to that in 2018, but 32,000 people were still very appreciative of this Twitch user’s efforts (though most probably didn’t care about his feet).